In many areas of engineering, interoperability is a goal when technical systems are designed. This is true also for the domain of electrical engineering and in particular for substation automation systems. The IEC61850 standard addresses this challenge and is the focus of this thesis. 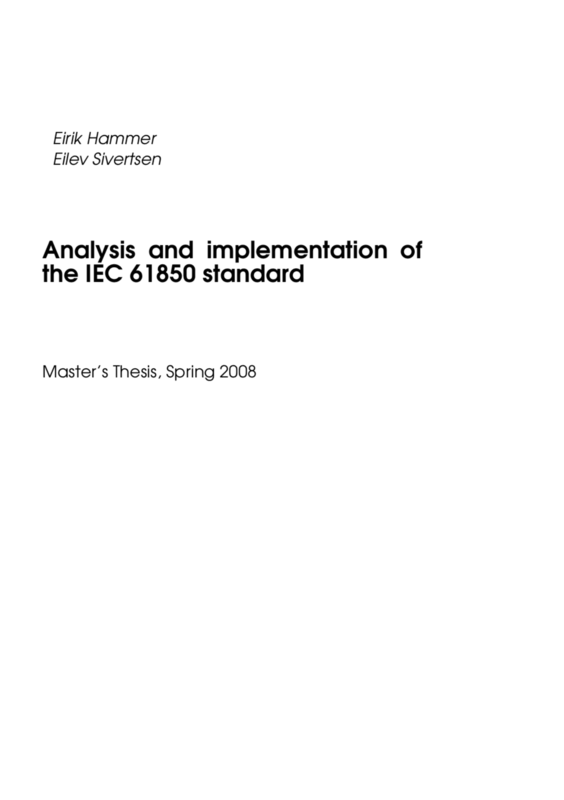 The thesis analyses the IEC61850 standard and gives an overview of its content. The analysis places the Brodersen RTU32 in relation to the scope of the standard. A basic IEC61850 server is designed and implemented for the RTU which runs under Windows CE. The system consists of an information model and an information exchange model and is capable of basic client/server communication. Basic services, such as reporting and logging are implemented which allow a client such as a SCADA system to review historical data for a substation and receive reports based on events in the substation. 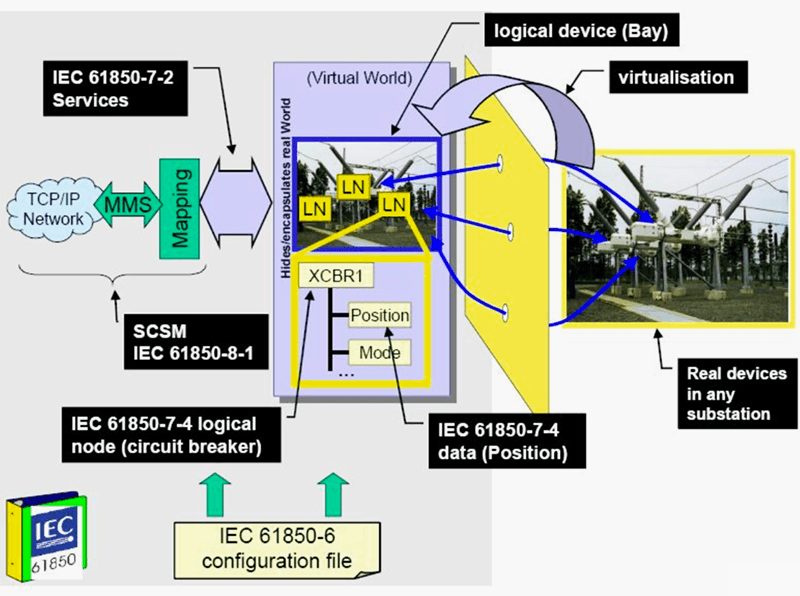 Conceptual modeling approach of the IEC61850 standard. A real physical substation is modeled into a virtual substation. The virtual substation contains a detailed data model encapsulating the real world objects and services are mapped to a network communication protocol. Relevant parts of IEC61850 are shown. An SCL parser is included in the implementation which allows a substation to be configured according to the SCL configuration file format defined in the IEC61850 standard. Substation automation is essential in order to maintain an efficient and reliable electrical infrastructure. The IEC61850 standard is developed to make this automation interoperable and cost-efficient. The IEC61850 standard has a number of benefits compared to previous standards which are often referred to as legacy standards. These can be described as ’artifacts of the eigthies’ – the time in which many of them were developed. The communication protocols of these legacy standards were developed for serial link technology and were later adapted to run over TCP/IP-Ethernet. From the start, one of the objectives of the legacy protocols was to account for bandwidth limitations by minimizing the number of bytes sent. Many of these protocols were proprietary and thus communication between devices from different vendors was generally not possible. 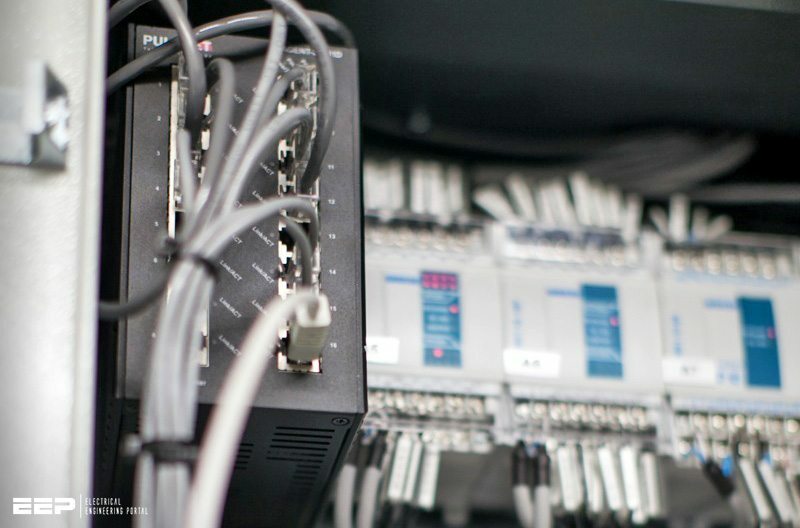 From the start, the IEC61850 standard was designed to operate over modern networking technologies. Interoperability is ensured by the standard and many features are included which it would be impossible to include using previous standards. Less manual configuration is needed for client applications and devices, reducing errors and lowering commissioning cost.